Protect the Arctic Refuge. 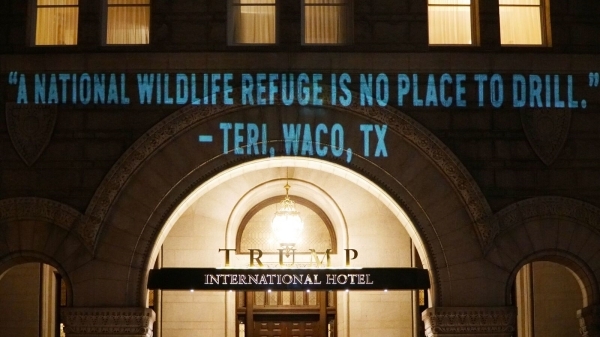 The message illuminated Trump International Hotel sending a hard to miss directive to Republican leaders in Washington, D.C. currently rushing through the tax scheme. The plan seeks to offset tax cuts for the wealthy and corporate polluters with revenue from drilling in the Arctic Refuge’s coastal plain– an area vital for the survival of the Gwich’in Nation, and one of the country’s last remaining wild places. Featuring actual quotes from people across the country, the projection demonstrates the widespread opposition to opening the sensitive coastal plain of the Arctic Refuge to oil and gas drilling.